The past few days have been SO nice out! We’ve been going for long walks with light(er) coats on – feeling the glorious sunshine without being bundled up in scarves, hats, and gloves. It’s funny the things you learn to appreciate as the seasons change. So speaking of sunny thoughts, my mind is on brunch this weekend and I’m feeling fruity. With Easter, Mother’s Day, and other brunch-y holidays on the horizon, I thought I’d share one of my favorite recipes to make for a group… baked oatmeal! I love this recipe because you can assemble it ahead of time and bake it as you’re ready to serve. When your guests walk in, your house will smell amazing! Just pour the coffee and you’re done. Whole rolled oats: The essential ingredient in baked oatmeal! Be sure to use whole rolled oats, not instant. Flaxseed: This makes the recipe vegan. You could use 2 eggs if you don’t have flax. 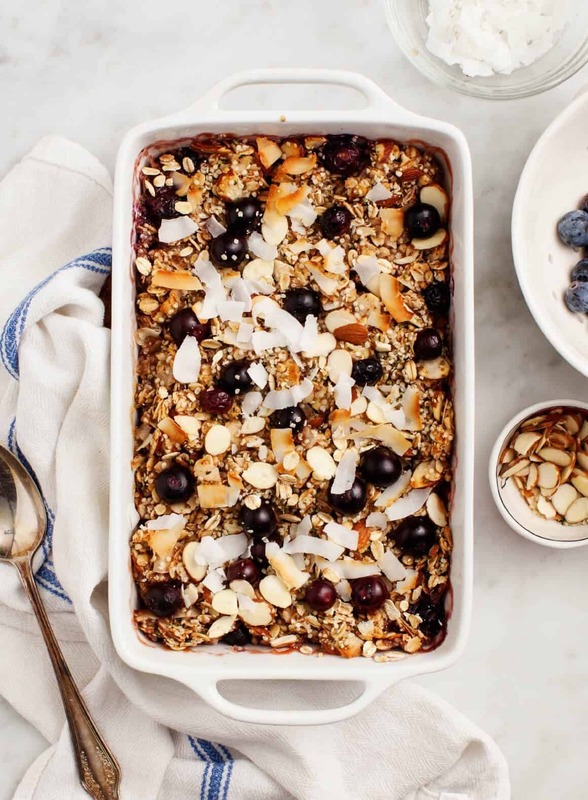 Sliced almonds, hemp seeds, and coconut flakes: These healthy ingredients add texture and delicious, nutty flavor to this baked oatmeal. If you can’t do nuts, just add extra hemp seeds. If you don’t have hemp seeds, add extra almonds. If you don’t like coconut, skip the coconut flakes! Brown sugar or coconut sugar and maple syrup: this combination adds the perfect sweetness to offset the tangy blueberries. Cinnamon: can oats exist without cinnamon? Almond milk: You can also use any type of milk you like. Coconut oil: This gives the oats a nice, toasty baked texture. Banana: I layer banana slices on the bottom of the baked oatmeal. I love how they gives this a soft texture and banana bread-like flavor! Strawberries: These create a nice, juicy later under the toasty oats. Blueberries: Because this is blueberry baked oatmeal! Fresh or frozen blueberries will work here. In the oven, the top layer will get crisp and toasty, while the middle will stay soft. I’m still counting this as a brunch recipe, but it’s also good for dessert with a scoop of ice cream. Preheat the oven to 350°F and spray an 8×8-inch (or similar) baking dish with cooking spray. In a small bowl, combine the flaxseed and warm water and set aside to thicken for about 5 minutes. Reserve 2 tablespoons of the almonds, hemp seeds and coconut flakes and set aside. In a large bowl combine the oats, the remaining almonds, hemp seeds and coconut flakes, and the baking powder, cinnamon, brown sugar and salt. In a medium bowl, combine the almond milk, maple syrup and coconut oil and whisk to combine. Stir in the flaxseed mixture and blend until smooth. 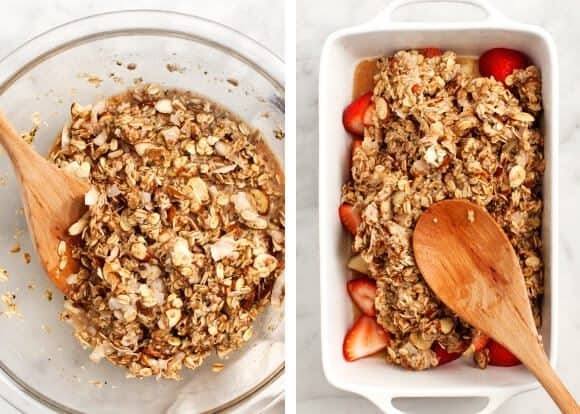 Layer the bananas and strawberries in the baking dish and spread the oat mixture on top. Sprinkle with the blueberries and the reserved almonds, hemp seeds and coconut flakes. Bake for 40-50 minutes or until the top is crisp and the middle is set. I find it easiest to wedge a knife in and make sure the middle has thickened nicely. Remove and let cool for 15 minutes before serving. If you’d like to reduce the sugar in this recipe, omit the brown sugar and use ⅓ cup maple syrup.